Recently, we came across a person who was mis-sold a ULIP. Yes, mis-selling of ULIPs still continues. This lady got a call from her insurer, a reputed private sector insurance company, she was told that the ULIP she had purchased earlier was not performing well, and the company is discontinuing it. The company suggested that she should buy a new ULIP with better prospects. The lady fell for it and completed all the formalities as directed by the agent. But she was shocked when her bank account was debited with Rs 1 lakh, the premiums of both the insurance policies. In short, the first policy was never discontinued. When she reached out to us through a friend, we advised her to stop her ULIPs. We told her she might lose most of her premium she paid for the ULIPs, but she would be still better off if she invest in a mutual fund. However, the lady was not ready to discontinue her ULIP investments as she was scared of losing her money. Are you in a similar situation? Do you want to get out of your bad ULIP investments, but not convinced how you would be better off by investing in mutual funds, even after the reintroduction of long term capital gains (LTCG) tax. Here we have tried to illustrate how it makes sense to surrender your ULIP which was mis-sold to you and invest the money in mutual funds. The table clearly shows that mutual funds win. If we look at the life insurance of Rs 6 lakh offered by the ULIPs, It is clearly not enough to take care of the financial need of your family after your death. If we look at a pure term insurance cover of Rs 25 lakh life cover, four times the sum offered by the ULIPs, it will cost only around Rs 300 per month. If you invest the rest of the money in a mutual fund scheme, you would still make Rs 8.44 lakh (at 8%), Rs 15.83 lakh (at 12%), and Rs 17.74 lakh (at 15%). How UTI Long Term Equity Fund performed? With a 10-year return of 8.18%, the fund has underperformed the category (10.2%) and has beaten the index (7.48%) by a slim margin. The fund has underperformed peers over the past decade. UTI Long Term Equity Fund is in a transition phase, moving away from its earlier large-cap driven mandate to a higher mid-cap exposure. The fund’s large-cap bias was the main reason why it under performed peers—which benefited from their higher mid-cap exposure. The fund has consolidated its portfolio from around 90 stocks in May 2016 to 63 now. This has also allowed it to take higher exposure in its top picks. UTI Long Term Equity Fund sector positioning will now remain neutral vis-a-vis the index. Top stock picks continue to be mostly index heavyweights, but the fund managers are comfortable taking healthy active positions and stepping beyond the index a little. No longer a conservative offering, investors should wait to see if the fund is capable of executing its new approach. Many investors are putting in money into the dividend option of mutual fund (MF) schemes. Some cash flows from their investments helps them manage their expenses. What does dividend in a mutual fund mean? Any mutual fund scheme — be it debt, equity or hybrid — can declare dividends for its unitholders from the realised profits in its portfolio. Realised profits are the gains made from instruments by selling them at a price higher than what they were purchased for or when the securities held in the scheme receive dividend or interest (in the case of debt funds) from the instruments held. As per regulations, unrealised profits from the instruments held cannot be used to pay dividends. These profits are added to the net asset value (NAV). A part of this can be declared as dividend depending on the fund manager. Alternatively, the fund manager also has the option to deploy the money back in buying stocks or debt instruments in line with the scheme objectives. With what frequency can investors expect a dividend in a mutual fund scheme? Mutual funds could pay you daily dividend, monthly dividend, quarterly or annual dividends. This could vary from one scheme to another. There is no guarantee of dividend payment, but most of them endeavor to pay dividend and stick to their respective mandate. For example, several liquid and ultra short term funds endeavor to pay a daily dividend, while some equity funds pay quarterly and annual dividends. However, the dividends are not certain and the amount is also not fixed. Are dividends on MFs taxed? Dividends from any MF scheme is tax free in the hands of the investors. However, in the case of debt funds, the fund house pays a dividend distribution tax of 28.84% which includes surcharge and cess. In an equity mutual fund, there is no dividend distribution tax. Who should opt for the dividend option? Financial planners recommend dividend option for investors who need some cash flows. Those looking to build wealth over the long term through equity mutual fund using SIP, should opt for the growth option. This is because the compounding benefit is lost when dividend is paid, unless the amount is invested immediately in a higher than equity yielding asset. For those in the highest tax bracket investing for a period less than three years, could opt for the daily dividend option in liquid /ultra-short term funds as the dividend distribution tax is 28.84% compared to their individual tax slab of 30.9%. Equity-income funds are not as safe as debt funds but are far more safe than equity funds. Equity-income funds are typically one-third equity, one-third arbitrage and one-third debt. Arbitrage position is almost like a liquid fund. In arbitrage, the fund manager buys a share and at the same time sells it in futures market. He is actually not exposed to equity risks for this one-third of his investment. The tax treatment is like equity because arbitrage position is technically equity but by character it is fixed income. Equity-income funds qualify as a very tax efficient way of investing with low risk but it is not as safe as a debt fund because around 35 per cent is exposed to pure equity. However, it is not very risky. It is an excellent way of investing if you are holding it for three to five years and if you are a risk averse person and also want to optimize the reruns in a tax-efficient way. And you can very well invest a lumpsum because this is something where only one-third of your money will be exposed to equity. DSP BLACK ROCK TAX SAVER FUND enjoys an impressive track record, having outperformed its category average in seven of the past nine calendar years. DSP BLACK ROCK TAX SAVER FUND maintains a heavy largecap bias, where its exposure is higher compared to peers in the same category. With around 70 stocks, the fund’s portfolio is heavily diversified but it retains a healthy exposure in its top picks, allowing higher impact of conviction bets on portfolio returns. The portfolio turnover is on the higher side, which suggests the fund manager churns stocks often to capitalise on market trends. DSP BLACK ROCK TAX SAVER FUND has managed to deliver higher alpha than many of its peers, despite its large-cap tilt. With a healthy risk-reward profile, this fund is a worthy pick for conservative investors looking for a tax saving fund. Find out how this ratio can help you take an informed decision while investing in mutual funds. Investors tend to attach much importance to the price-to-earnings (PE) ratio and market capitalisation of a stock while buying. When used in conjunc tion with other metrics, these numbers can help in picking the right stock at the right time. But can they also help select the right mutual funds? You may find it difficult to ascertain the investing style and preferences of the fund manager only by looking at the fund portfolio. This is where the fund’s PE ratio and average market capitalisation become good reference points. You can make more informed decision using these numbers. In mutual funds, the PE multiple of a scheme is arrived at by using a weighted average of underlying stocks. In other words, it is the average of the PE of all the stocks that make up the fund’s portfolio, in proportion to their allocation within the portfolio. A high portfolio PE would indicate that the scheme mostly holds stocks that are quoting a valuation premium. This indicates a preference for growth oriented businesses. In a growth based approach, the fund manager does not shy away from paying a high price for stocks that are exhibiting healthy growth in profitability. On the contrary, if the PE of the mutual fund is on the lower side, it signifies a value-conscious approach. Here, the fund manager is more comfortable looking for stocks that are currently out of favour or where the stock price has been beaten down disproportionately to the fundamentals of the company. Growth oriented funds tend to exhibit strong returns within a short span of time but are more volatile. Value conscious funds typically yield great results over a longer period of time and come with lesser volatility in returns. But the PE ratio is not of much use if used in isolation. Experts suggest using it in conjunction with the average market capitalisation to truly gauge the investing style of the fund. Both metrics should be evaluated within the broader context of its strategy. The valuation metrics in a mutual fund should not be used as an indicator for timing entry or exit, but for relative comparison. Check where the fund’s PE stands in comparison to its peers. Typically, schemes in large-cap category will carry a higher PE multiple compared to mid-cap and small-cap funds. One should compare within the category to ascertain how the fund manager is positioning the portfolio as also how much risk he is taking on to deliver returns. Bala explains, If a mid-cap fund is carrying a lower market capitalisation than its peers, it suggests the fund manager has dug deeper into mid-and-small cap universe of stocks and is indicative of higher level of aggression. Similarly, a large-cap fund with a much higher average market capitalisation relative to peers implies the fund is more of a pure-play large-cap fund. Take for instance the Motilal Oswal MOSt Focused 25 Fund, which is a large-cap offering. This top performing fund currently has an unusually high portfolio PE of nearly 25 compared to the category average of 19. This clearly suggests an emphasis on selecting high growth businesses. However, the fund’s average market capitalisation stands at nearly half the category average of `1.03 lakh crore. This shows the fund has chosen more nascent large-cap stocks rather than pure-play large-caps. A completely different approach is visible in Franklin India Bluechip, another solid large-cap offering. This fund carries a much lower PE ratio of 18.3 but the portfolio’s average market capitalisation stands at `1 lakh crore. This suggests the fund follows its large-cap mandate to the hilt and refrains from paying a high premium for growth. Similarly, a higher average market capitalisation within the mid-cap funds category would suggest the fund manager’s preference for nascent large-caps rather than pure mid-caps, while a lower valuation would imply a value-driven strategy. The Franklin India Prima Fund, for instance, has a market capitalisation closer to its category average but a lower PE, suggesting a valuation conscious approach. The average market capitalisation is useful in finding out if a fund is following its mandate. We have examples of funds whose mandate is to select stocks from the mid-cap space. However, an analysis of the average market capitalization shows more than 50% of the portfolio is concentrated in large-cap stocks. Such violations of the mandate defeat the purpose of investing in mid-cap funds, which is to create alpha. These metrics can also be used for delving into funds belonging to the disparate multicap and ELSS categories. Given their multiple flavours, investors may struggle to make an informed choice based only on the return profile of the funds. A closer look at the PE ratio and market capitalisation reveal how the funds are placed in terms of investing preferences. Take for instance the top two performing funds in the ELSS category. With a PE of 29.3 and average market capitalisation of `47,444 crore, Axis Long Term Equity is clearly into growth-oriented businesses. Reliance Tax Saver on the other hand has a PE of 22 and market capitalisation of `18,771 crore, indicating preference for mid-sized businesses and a blend of value and growth approach. Investors should pick funds suiting their risk profile and needs, after filtering based on long-term return profile. High focus on large-sized companies is a sensible strategy at a time when mid-sized companies are trading at peak valuations. Among schemes, which have a high exposure to large-sized companies, and at the same time, are equally committed to cash in on growth stories in mid- and small-sized companies, is Kotak Select Focus. Kotak Select Focus Fund scheme has more than 70% of its exposure to large-sized companies, and the rest is dedicated to mid- and small-sized companies. Among multi-cap schemes, Kotak Select Focus has distinguished itself by employing concentrated strategy on sector level and diversified exposure to stocks. This has worked well as it has beaten its benchmark every time in the past seven years. It has delivered 14.7% and 20.4 % in the past three-year and five-year periods, while its benchmark Nifty200 has given 11% and 14%, respectively during the same period. In the past six months, the scheme has enhanced exposure in diversified themes, such as retail to construction. Some of these prominent companies are Bata India and Larsen & Toubro. To achieve capital appreciation in medium to long term by investing in equity and equity related instruments of select stocks. • A concentrated large-cap fund. • The fund would be investing in a MAXIMUM of 35 stocks across sectors with the objective to deliver consistent and steady returns over time with limited volatility. • The fund would have >80% of the corpus invested in well managed and established large cap companies (Top 100 companies). • The fund would follow a bottom up approach in stockpicking based on in- house research and fund managers conviction and would generally be focussed around 3-4 themes. • The investing style would have GARP (Growth at Reasonable Price) bias. How has Kotak Tax Saver Fund performed? The fund has lagged behind peers over the past decade. With a 10-year return of 9.55%, the fund has lagged behind the category (11.57%), but has managed to outperform the benchmark index (8.8%). This tax-saving fund has been rather inconsistent in its performance in recent years, lagging behind peers in its category. The fund’s distinct large-cap bias may be partly responsible for this, as peers have benefited from higher mid-cap exposure. However, the Kotak Tax Saver Fund has ramped up its mid-cap presence over the past year. 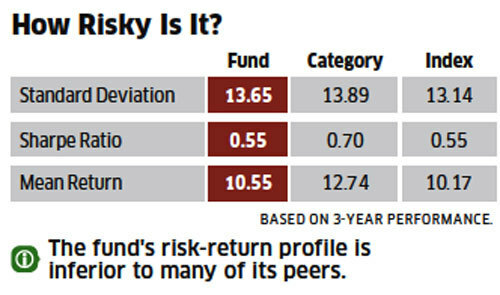 The fund is reasonably diversified with healthy exposure in its top picks—mostly index heavyweights. The fund manager is comfortable taking high active positions in lesser-known stocks as well. Barring its heavy overweight stance in construction space and underweight position in automobiles, its sector positioning is in line with the index. With more proven performers in this segment, the fund needs a substantial improvement in return profile to be considered a worthy pick. To generate income and capital appreciation from a diversified portfolio predominantly investing in Indian equities and equity related securities of companies which are not part of the top 100 stocks by market capitalization and have market capitalization of atleast Rs.100 Crores at the time of investment. The standout feature of this fund is its ability to hold onto its five-star ranking without even a small blip since it made its debut in the ratings. Mirae Asset Emerging Bluechip Fund lives up to the ‘blue-chip’ tag in its name by scouting for quality names in the mid-cap space. It has outpaced both its benchmark and peers every year since its launch in 2011. Mirae Asset Emerging Bluechip Fund has the leeway to invest up to 35 per cent of assets in the top 100 companies by market cap, with 65 per cent parked in mid-cap stocks. The fund prefers to select its portfolio candidates from companies which generate operating profits of around Rs 100 crore. It consciously avoids tiny businesses or micro caps. Though quality conscious, the fund has avoided the temptation to chase quality at any price. This is one of the key factors contributing to its consistency. Mirae Asset Emerging Bluechip Fund returns have stayed ahead of both benchmark and category returns on a one, three and five-year CAGR, unusual for the category. While many mid-cap funds have found it a struggle to stay ahead of the benchmarks in the last one year, this fund has managed it. The fund has shown ability to keep up with both style and sector rotation in the markets through timely portfolio shifts. On three and five-year returns, it has outperformed its benchmark by 6 to 11 percentage points and the category by 6 to 7 percentage points. Bull or bear phases have gone equally well for the fund during its short tenure, though it is yet to come up against a vicious bear phase like in 2008.